Authorities in Louisiana are searching for a suspect in Saturday’s shootings in Ascension and Livingston Parish. A 21-year-old man suspected of killing his parents and three other people was arrested Sunday when he drove up with a gun to his grandmother's house in Virginia, a sheriff said. 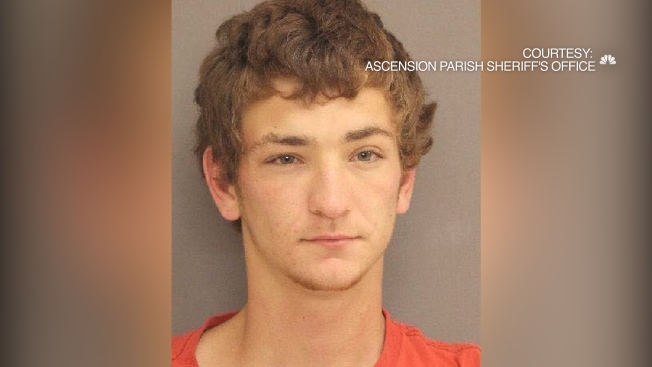 On Saturday, Dakota Theriot shot and killed three people — a young woman, her brother and her father — in Louisiana's Livingston Parish before taking her father's pickup truck, driving to neighboring Ascension Parish, and shooting his parents, according to authorities. Theriot's grandmother in Warsaw, Virginia, had checked into a hotel Saturday night, fearing he might show up there, Richmond County Sheriff Stephan B. Smith said in a phone interview. The woman asked authorities to check her house Sunday morning to ensure it was safe before she returned. While deputies were there, Smith said, Theriot drove up with a firearm pointed out the window of a pickup. A sheriff's statement said deputies sought cover and challenged Theriot, who then dropped the gun and was arrested without incident. Smith said the pickup Theriot drove apparently was the one taken in Louisiana. In Louisiana, at a trailer where the suspect's parents lived, drops of blood trailed out to the front steps from the bedroom where Keith and Elizabeth Theriot were shot. In the bedroom, blood-soaked pillows were strewn on a bed, and patches of what appeared to be dried blood were on the floor. Dozens of stuffed animals decorated the room. Kim Mincks and Jacob Chastant also lived in the trailer and were friends with the Theriots. Mincks said she was in the house at the opposite end of the trailer when the shooting happened but added she didn't hear anything. Law enforcement officers came into her room Saturday morning and woke her. "They said something terrible happened here. 'Get up, get dressed and walk outside,'" she recalled them saying. Mincks and Chastant said Dakota Theriot had struggled with drugs over the years, had violent outbursts, and had recently been kicked out of the trailer. "We know he had a drug problem. He got kicked out last Monday because of the drug problem. His dad kicked him out of here. He did have a violent streak," Mincks said. Theriot will be brought back to Ascension Parish to be booked on two counts of first-degree murder, home invasion, and illegal use of weapons, said a statement by Ascension Parish Sheriff Bobby Webre and Livingston Parish Sheriff Jason Ard. Authorities have identified the victims in Livingston Parish as Billy Ernest, 43; Tanner Ernest, 17; and Summer Ernest, 20. Ard earlier said that Summer Ernest and Dakota Theriot were in a relationship and that Theriot had been living with her family for a few weeks; however, the family strongly denied that the two were dating. Authorities said earlier that Keith Theriot survived the shooting long enough to let them know who shot him. According to Webre, officials got a "dying declaration from him, and only enough information to let us know that it was his son that committed this act." Mincks and Chastant only returned to the trailer Sunday morning, worried Dakota Theriot might come back. Mincks said she'd known Keith and Elizabeth Theriot for about two years and described them as wonderful people. Keith Theriot was a disabled veteran who played a wicked guitar, and Elizabeth Theriot worked at a nearby Dollar General Store, they said. Keith Theriot had four children, all boys, they said. "Give you the shirt off their back. They loved everybody. Never met a stranger. Loved each other. Just a happy couple," she said. But the relationship between Dakota Theriot and his parents, especially his father, was troubled. She and Chastant described an incident in which Chastant had to pull Dakota Theriot off his parents during a physical altercation. Minks said Dakota Theriot and his mother seemed much closer. They'd laugh and joke and tell each other "I love you." But even that relationship had problems. Mincks and Chastant said at one point Dakota Theriot pulled a gun on his mother who called Chastant for help. "I think just the drugs took over," Mincks said. Chastant and Mincks said Dakota Theriot had just met Summer Ernest about three weeks ago at Chastant's sister's funeral. Summer Ernest was there as a friend to Jacob Chastant's 20-year-old daughter, Sierra. Sierra said she warned her friend to stay away from Dakota, calling him "trouble." But she never expected anything like what unfolded Saturday. Summer Ernest had an outgoing personality and was planning to return soon to college, Sierra said. "She was bubbly, always friendly ... She's just a great person," she said. "If you asked me what his motive was.... I don't know what it would be," she said. "It's just unbelievable." Associated Press writers Kate Brumback in Atlanta and Jonathan Drew in Raleigh, North Carolina, contributed to this report.